From the outside, the Luthan Hotel and Spa in Riyadh's diplomatic quarter looks just like any other modern hotel. But step inside the discreet, frosted-glass building and you enter a women's world which men are forbidden to enter. 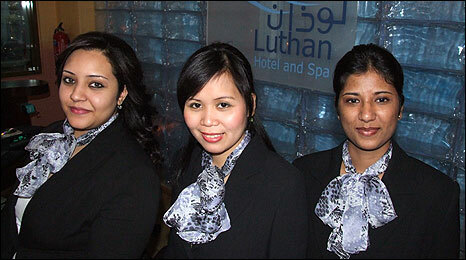 The Luthan is the Middle East's first women-only hotel, and as well as catering just for female guests, all the staff are women too. Western travellers like the Luthan because, once safely inside the hotel's walls, they can remove the headscarves and long black abayas that all women must wear in ultra-conservative Saudi Arabia. As you might expect, the hotel's decor is a tribute to all things girly. Instead of the corporate beige that many top hotels favour these days, rooms at the Luthan are decorated in bright pinks and purples, and tea lights twinkle around the clock - the staff are constantly lighting candles. "It's delightfully feminine, I think," says hotel manager Lorraine Coutinho. "The concept was an all-women idea, the owners and investors are all women, and the designer was a female. It's a place created by women, for women." You might think that staffing a hotel entirely with women in Saudi would have been problematic, but Ms Coutinho, who has hired women from around the Arabic-speaking world, insists the recruitment process was easier than expected. "We have female duty engineers and IT technicians, and it wasn't at all difficult to find women for front office or housekeeping positions," says Ms Coutinho. I like challenges. In most of the hotels in the world you only have bellboys, so I think I'm the first pioneer bellgirl! "We don't survive entirely without men - we haven't been successful in finding plumbers or electricians - but I feel it's more than an achievement and we are making history." At just 26, Samira Ali is the hotel's chief IT engineer and says the women-only environment at the Luthan has allowed her to find work in what's still a male-dominated field. "As an IT specialist here in Saudi Arabia it's difficult for ladies," says Samira, who comes from neighbouring Yemen. "It's not easy to work in a company, male and female together, so I feel really lucky. It looks like women can do anything and everything in their world, and nothing is difficult." The Luthan also employs what are possibly the world's first female bellhops. 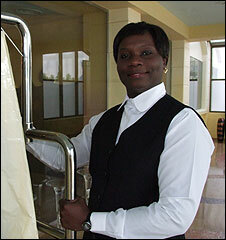 Kenyan Mildred Obaga originally applied for a job as a room attendant but, when offered the bellhop position, jumped at the chance. "At times the guests will come with heavy, heavy luggage," admits Mildred. "I find it so hard to lift the luggage but I try my level best because I like challenges. In most of the hotels in the world you only have bellboys, so I think I'm the first pioneer bellgirl!" Several Saudis also work at the hotel, a sign of how much the kingdom has changed over the past few years. Saudi Arabia's ruler, King Abdullah, recently appointed the country's first ever female minister to his cabinet, and barriers to women working are being gradually stripped away. That is especially important because, despite its vast oil wealth, the country currently has a big unemployment problem. Things are particularly grim for women - official estimates say 25% of women are unemployed, but some analysts suggest the real figure could be far higher. Concerted efforts are now being made around the kingdom to lure Saudi women into the labour market. Susan Alshami runs a specialist training academy where women are taught how to make goods from home that can later be sold on to shops. She says that 10 years ago, few women actively sought employment, but today things could not be more different. "Every year the demand for ladies to be employed is increasing and the private sector is now asking for more females," explains Susan. The emergence of a niche "women-only" market in the kingdom is also helping to create more jobs. Shopping malls designed exclusively for women are now all the rage in Saudi Arabia. As well as providing an income for female shopkeepers, everybody from the security guards to the malls' marketing managers are women too. At least 20 such malls will open in Saudi Arabia over the next few years, and there is a sense that women are finally starting to get a proper foothold on the job ladder. But for all its advances, Saudi Arabia is still deeply conservative at heart. Although women can now work everywhere from the private sector to the government, they still have to be driven to work by a man, as the law forbids them to drive. Saudi women may be making strides in the workplace, but - for now - men are still firmly in the driving seat.